South Gallia senior Curtis Haner (5) hits a two-pointer to end the first half of the Rebels’ 62-61 victory over Southern on Friday night in Mercerville, Ohio. 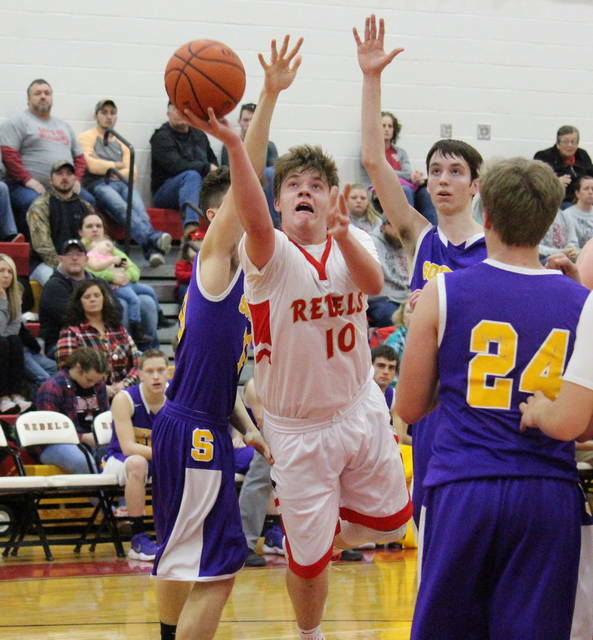 Southern sophomore Trey McNickle leads South Gallia sophomore Jared Burdette (3) on a fast break, during the Rebels’ 62-61 triumph on Friday in Mercerville, Ohio. MERCERVILLE, Ohio — What a difference a month makes. 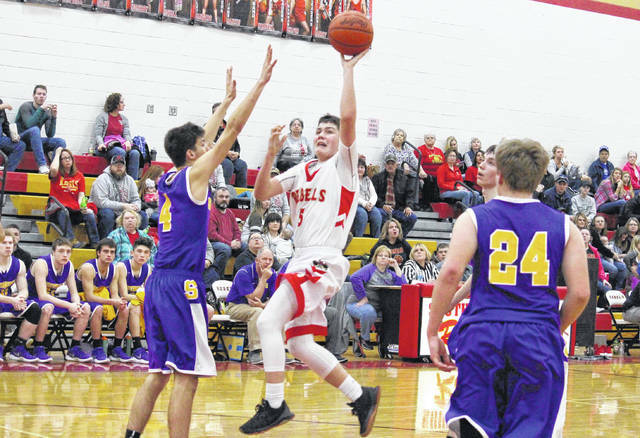 After an 88-41 setback on Dec. 8 in Racine, the South Gallia boys basketball took its revenge on Friday night in Gallia County, defeating the Tornadoes by a 62-61 tally in Tri-Valley Conference Hocking Division play. South Gallia (2-9, 1-6 TVC Hocking) never trailed in the first half, fighting through just one tie, at 2-2. SGHS led by as many as eight points in the opening quarter, but Southern (6-5, 4-3) ended the period with a 5-0 run, making the Rebel lead 14-11. The hosts scored the first 11 points of the second quarter, however, making their advantage 25-11 with 5:05 left in the half. The Tornadoes were back to within 10 by the midway point of period, but SGHS closed the half with a 16-9 run and a 41-24 lead. In the opening three minutes of the second half, South Gallia outscored Southern by a 7-6 clip, giving the Rebels their largest lead of the night at 48-30. However, the Tornadoes ended the third quarter with a 16-to-6 run, trimming their deficit to 54-46 headed into the finale. The guests continued to chip away at the margin and with 49 seconds left in the game, a Dylan Smith two-pointer gave Southern its first and only lead of the game, at 61-60. The Rebels regained the advantage just 17 seconds later, as senior Austin Stapleton hit back-to-back free throws. After a pair of timeouts, SGHS junior Eli Ellis came up with a steal with just under 10 seconds to play. The Rebels’ missed the front end of a 1-and-1 with five seconds left, but Southern failed to get a shot off in the final seconds and fell by a 62-61 count. After missing just four field goal attempts in the first half, the Rebels finished the game shooting 25-of-44 (56.8 percent) from the field, including 7-of-12 (58.3 percent) from beyond the arc. Meanwhile, Southern was 22-of-66 (33.3 percent) from the field, including just 2-of-18 (11.1 percent) from three-point range. From the free throw line, SGHS shot 5-of-12 (41.7 percent) and SHS shot 15-of-24 (62.5 percent). The Rebels claimed a narrow 35-to-33 rebounding advantage, despite Southern grabbing a 25-to-13 edge in offensive boards. Both teams finished with 10 assists, while the Tornadoes picked up advantages of 13-to-4 in steals and 3-to-1 in blocked shots. Southern turned the ball over just 11 times in the setback, while SGHS gave the ball away 27 times. SGHS junior Braxton Hardy hit a game-best three trifectas and finished with 21 points, 19 of which came in the first half. Curtis Haner recorded 16 points, seven rebounds and four assists for the Rebels, while Ellis had 15 points and a game-high nine boards. Stapleton hit a pair of three-pointers and finished with eight points for the victors, while Jared Burdette added two markers. The Rebel defense was led by Stapleton with two steals and Austin Day with one rejection. Smith led the guests with 15 points, 13 of which came after halftime. Weston Thorla had 13 points and seven rebounds in the setback, while Austin Baker marked 10 points and a team-high eight rebounds. Brayden Cunningham scored eight points and pulled in seven boards for Southern, while Trey McNickle had six points and a game-best seven assists. Jensen Anderson contributed five points to the Tornado cause, while Larry Dunn and Coltin Parker chipped in with two each. McNickle led the SHS defense with five steals and one block, followed by Cunningham with two steals and two blocks. 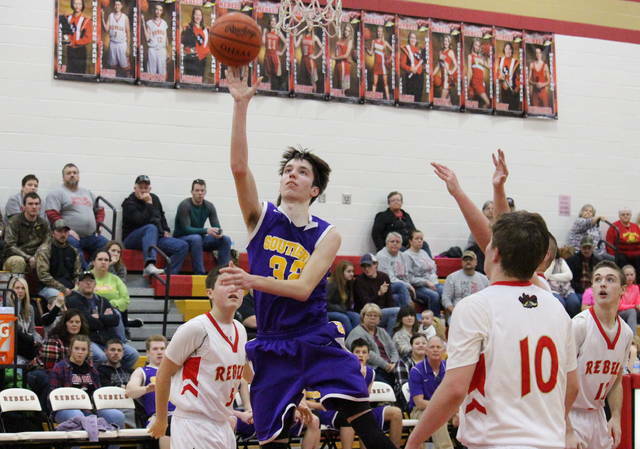 Both teams continue league play on Tuesday, as the Tornadoes host Trimble and the Rebels travel to Federal Hocking.